With the Varsity Reds 2-1 victory over St. FX last night UNB head coach Gardiner MacDougall became only the 7th head coach in CIS history to accumulate 300 victories, joining Dave Adolph (Saskatchewan), Clare Drake (Alberta), Wayne Gowing (Laurier), Graham Wise (Ryerson), Clarke Singer (Western), and Jacques Laporte (UQTR). He ranks 4th among active coaches behind only Adolph (400), Wise (353), and Singer (314), who is taking a sabbatical this year and is expected to return behind the Mustang's bench next season. 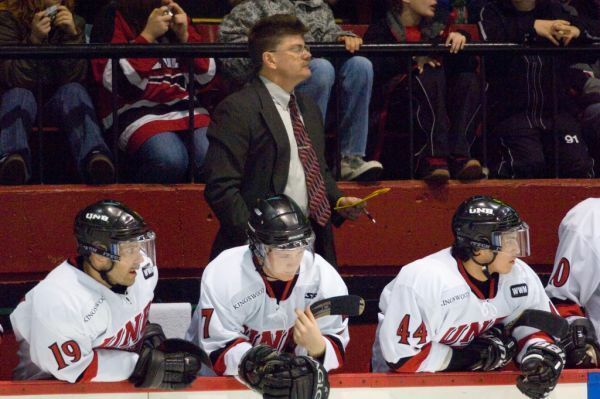 - His overall record (conference, playoffs, University Cup) currently sits at 300 wins - 115 losses - 18 ties - 16 OT/SO losses in 13 seasons behind the V-Reds bench, which is good for a 0.706 winning percentage. - Broken down further, he is 243-84-18-16 in conference play (0.720 winning percentage), 42-26 in the AUS playoffs (0.618), and 15-5 in the University Cup (0.750). - His record at the University Cup includes a 2-2 record vs. Alberta, 2-1 vs. Western, 2-1 vs. UQTR, 2-0 vs. Lakehead, 2-0 vs. Saskatchewan, 1-0 vs. Calgary, 1-0 vs. McGill, 1-0 vs. Moncton, 1-0 vs. Brock, 1-0 vs. Ottawa, and 0-1 vs. St. FX. -On the road MacDougall has accumulated a record of 106-51-11-13 in conference play (0.652), but only 15-16 in playoff games (0.484). - In exhibition games, which does not count towards the 300 victories, MacDougall has a record of 77-29-3-4 (0.712), which includes a mark of 48-8-1-1 (0.845) in home games and 29-21-2-3 (0.573) in road games. - When taking into consideration every game (exhibition, conference, playoff, University Cup) MacDougall`s overall record while at UNB is 377-144-21-20 (0.707) - 212-51-8-4 (0.793) at home and 150-88-13-16 (0.616) on the road and 15-5 (0.750) in the University Cup, which I classified as neutral site games despite 11 out of the 20 having been played at the AUC. Special thanks to Eric Drummie and the ReDSea Database for contributing to this post.